Shrimp called Rimicaris hybisae at deep hydrothermal vents in the Caribbean seem to have different dietary habits depending on the proximity of other shrimp. In dense clusters, the shrimp live moslty off bacteria, but when the shrimp population is sparse, they are more likely to turn carnivorous. Scientists at NASA’s Jet Propulsion Laboratory reveal that the extreme oasis of life deep in the Caribbean Sea may hold clues to life on other planetary bodies, including Jupiter’s moon Europa. 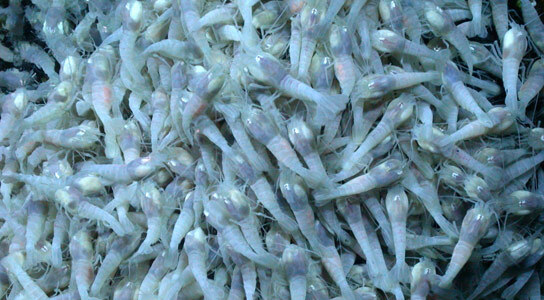 At one of the world’s deepest undersea hydrothermal vents, tiny shrimp are piled on top of each other, layer upon layer, crawling on rock chimneys that spew hot water. Bacteria, inside the shrimps’ mouths and in specially evolved gill covers, produce organic matter that feed the crustaceans. Scientists at NASA’s Jet Propulsion Laboratory in Pasadena, California, are studying this mysterious ecosystem in the Caribbean to get clues about what life could be like on other planetary bodies, such as Jupiter’s icy moon Europa, which has a subsurface ocean. The particular bacteria in the vents are able to survive in extreme environments because of chemosynthesis, a process that works in the absence of sunlight and involves organisms getting energy from chemical reactions. In this case, the bacteria use hydrogen sulfide, a chemical abundant at the vents, to make organic matter. The temperatures at the vents can climb up to a scorching 750 degrees Fahrenheit (400 degrees Celsius), but waters just an inch away are cool enough to support the shrimp. The shrimp are blind, but have thermal receptors in the backs of their heads. “The overall objective of our research is to see how much life or biomass can be supported by the chemical energy of the hot submarine springs,” Coleman said. Hydrogen sulfide is toxic to organisms in high concentrations, but the bacteria feeding the shrimp need a certain amount of this chemical to survive. Nature has worked out a solution: The shrimp position themselves on the very border between normal, oxygenated ocean water and sulfide-rich water so that they and the bacteria can coexist in harmony. “It’s a remarkable symbiotic system,” Coleman said. Coleman was part of a team led by Chris German at the Woods Hole Oceanographic Institution, in Woods Hole, Massachusetts, that discovered these vents in 2009, off the west coast of Cuba. This research, funded under NASA’s Astrobiology Science and Technology for Exploring Planets program, detected the vents by picking up the chemical signals of their plumes of water in the ocean. The researchers returned in 2012 on the RV Atlantis with a robotic vehicle called Jason, supported by the National Science Foundation. Scientists collected extensive specimens from two hydrothermal vent fields: The Von Damm field at 7,500 feet (2,300 meters) and Piccard at more than 16,000 feet (4,900 meters), which is the world’s deepest. Coleman and collaborator Cindy Van Dover, marine biologist at Duke University, Durham, North Carolina, examined the shrimp for the first time when the same team returned in 2013 on the RV Falkor, provided by the Schmidt Ocean Institute in Palo Alto, California. Van Dover returned soon after using the robotic vehicle Hercules aboard the Exploration Vessel Nautilus, and did more collections and studies. A bonus finding from studying this extreme oasis of life is that some of the shrimp, called Rimicaris hybisae, appear to be cannibalistic. The researchers discovered that when the shrimp arrange themselves in dense groups, bacteria seem to be the main food supplier, as the shrimp likely absorb the carbohydrates that the bacteria produce. But in areas where the shrimp are distributed more sparsely, the shrimp are more likely to turn carnivorous, eating snails, other crustaceans, and even each other. Although the researchers did not directly observe Rimicaris hybisae practicing cannibalism, scientists did find bits of crustaceans in the shrimps’ guts. And Rimicaris hybisae is the most abundant crustacean species in the area by far. The group received funding for shrimp-collecting expeditions from NASA’s Astrobiology Science and Technology for Exploring Planets (ASTEP) program, through a project called “Oases for Life.” That name is especially appropriate for this investigation, Coleman said. This research was conducted in collaboration with the Woods Hole Oceanographic Institution and Duke University. The Schmidt Ocean Institute provided technical and financial support for marine and underwater robotic operations during the 2013 RV Falkor cruise. The California Institute of Technology in Pasadena manages JPL for NASA. Be the first to comment on "Mysterious Ecosystem May Hold Clues to Alien Life"